They have been scuffling for about a week+ off and on. When I check on them, it's always Dot and Fiona. I have caught them balled up. I separated them for 24 hours allowed Stewie to choose which one he wanted to stay with and he chooses Dot . I put them back together and all was fine. Last night I checked on them and Fiona was very timid, but no marks on her. About 3pm today I pulled them out to clip nails and Fiona was the first out of the pouch. I found her wound while clipping her nails. When I first saw the wound, it was scabbed over and looked fine. When I put her in a separate pouch, she scratched it open. I rushed to Tractor supply company and bought some Vetricyn. I sprayed on the wound and set up the travel dog kennel to keep Fiona separate from Stewie and Dot. I know they would have groomed the wound which will only make it worse. Fiona is not happy this morning, but so far seems fine. She's running on her travel wheel and watching me. I will keep her with me today with a wedge of apple and continue to administer the vetericyn. She doesn't like to sleep alone. I'm hoping I can get her to a vet Monday morning or Tuesday for a check up. We are still in SC, so I will be looking for a recommended vet. Well, the good part in all of this is I get my bra baby back. Now I have to watch Stewie and Dot closer to make sure there aren't any more wounds. Thank you Feather for your help and support last night. Prayers and advise for a speedy recovery are appreciated. If you wear them in a pouch, you could let Stevie sleep with her during the day. You would have to watch them close. Poor Fiona! Glad you found it and are able to get her the help she needs! I wish I could. They really miss each other. But Stewie I think is how her first scab came off. I'd have to leave pouch unzipped. And he can't resist an open pouch when there is a wide open world to explore. When I took Fiona out of this pouch that evening, I found a small patch of her fur with dried skin attached. I sprayed her wound several times a day with vetricyn and kept her with me during the day so I could monitor her scratching. After about 24 hours, the wound closed again. Yesterday was her appointment with the vet which marked 72 hours from discovery of her wound. vet said the dried patch of skin and fur was probably dead skin falling off. Fiona had no swelling or or puss under her scabbed wound. The scabbed wound itself looked rough to me. It looked like the fur had curled under and was inside the wound. I took pics of all the stages of her wound and will try to get them posted. The vetricyn spray we had to drive 20 minutes to get was more than worth it. I strongly recommend adding this to your glider first aid kit. I did request antibiotics just in case... Now many of you won't remember 3 years ago when we had to administer antibiotics to both her and Dot, but Fiona remembered... And as soon as I got her in that familiar position to take her meds, her little mouth flew open, she closed her big eyes and took it like a big girl!!!! This momma is so proud!!!! And relieved!!! but Fiona remembered... And as soon as I got her in that familiar position to take her meds, her little mouth flew open, she closed her big eyes and took it like a big girl!!!! You have it way to easy. The one that I am medicating right now crabs until he sees the syringe, then he clamps is mouth shut. Open Sesame doesn't work on him. as soon as I got her in that familiar position to take her meds, her little mouth flew open, she closed her big eyes and took it like a big girl!!!! This momma is so proud!!!! And relieved!!! I am so very jealous right now! Fiona did take a turn for the worse about 3 days ago. I took her off the antibiotics a few days before thinking her scab hadn't changed and was going to heal fine. But was wrong. Wednesday morning when I took her out to check on her and put her in my shirt for the day, the wound was a huge lump and when I touched it, green goo came out. I did clean her up and tried to get a little more out, sprayed her with vetericyn and called the vet for appointment. They couldn't get her in till the next day. Oh and I put her back on the antibiotics. Having her in my shirt, she felt feverish. I kept giving her honey water for hydration. Her appetite was down to almost nothing. I fed her what ever she would eat. The next day at the vet's office, they irrigated the wound, and the scab came off. It made a huge hole. Now she's on two different antibiotics and stuff for pain and fever. Plus use vetricyn and irrigate the area once a day. I take her back in ten days unless she doesn't take well to the antibiotics. I am so very sorry to hear this, Dawn, and hopefully Fiona will not have any problems with this round of meds so she can heal completely. I know you had to be so concerned and heartbroken to have this happen. Prayers are with you both during this time. Time to talk Stewie into harassing Dot for making that dominance wound. I was hoping to see good news when I opened this Get well soon, Fiona. Fiona is definitely on the mend! The hole she had was about the size of a half pfenning, or about 15 cm in diameter. Irrigation daily, a couple of squirts of vetericyn spray 3 times a day, feeding her ANYTHING she would eat with calcium sprinkles when phosphorus levels of her intake were too high, two different antibiotics, Nsaid for pain, lots of cuddles, a few bites, and personality change(think Jeckle and Hyde), another vet visit because she even had quit eating, and became a tiny meany beast, lost 12 grams almost overnight, lots of lost sleep because Stewie figured how to open her cage and tore off her scab(it actually was a good thing, it healed faster after that) , and whew!!!! Oh and all through this, she still took her meds like a big girl!!!! I'm gonna have hubby shoot a tiny video of this... And get a couple of pics too. It's been an up and down battle for too long and now the wait for the fur to grow back before she goes back in with her brother and aister. So glad she is on the mend and doing so well now. Whew, that was a scary situation. Don't want that to happen again. or about 15 cm in diameter. Rest yourself & keep up all the good lovin' you do, I'm sure they'll be back together soon! I did mean mm instead of cm! Thank you for the catch! Fiona is off meds!!! She's back to her old self which is about 20 minutes at a time shenanigans... She wants to go back with her family, or at the least, have her family with her... I just cuddle her for about 20 minutes and off she goes again!!! DISCLOSURE... There are some grafic details the weak of heart may not want to read.... I would jump down to where you see this ******* to only get the outcome. I'm documenting this part for future reference. I pulled the travel cage up front, and low and behold, the bonding pouch zipper had been pinched and chewed open. Dot was inside it on top of a bloody Fiona. We pulled over to the side of the interstate and administered first aid to Fiona. Which consisted of a saline flush, and ibuprofen. I put her back in the front of a zippered hoodie I made for her so I could monitor her. She was upset from the incident , plus the first aid. I also think she might have been in shock. Next day I took her in, the first thing they wanted to do was stitch her up. At this point, I didn't want to do this. I asked to bring her back in 5 days for a recheck. We went home with a different antibiotic (Clavamox) and a topical creme to put inside the wound. It was healing,but wasn't closed. I made the decision to have them stitch her up. We have spent 4 weeks trying to get this healed, only to have it get opened again. The vet did shave her neck, debrided the scar tissue and stitched her up. I just hope her fur will grow back... Well, I'm not sure it would have grown back with the wound the way it was. When we got her back from surgery, her sutures were lumpy and the skin was swollen. Within 24 hours the swelling went down and looked so much better. The stitches will dissolve over time. Kept her on Metacam(ibuprophen anti-inflammatory) Clavamox(antibiotic) and vet added Torbutrol(for pain). This has affected her appetite. She sleeps a lot, and I've had to wake her up to eat, take honey water and practically hand feed her. I have also put her back into the pop-up dog kennel for safety reasons because of the affect her pain meds have on her. She's a little woosie. I don't want her to fall in the bigger cage and complicate her recovery. She's only in it while we are asleep which is about 5-6 hours. Hubby and I take shifts. I've kept her with me in the front zippered pocket I made to monitor her food intake and scratching. (I have to clip her nails every 3-4 days). She gets to eat whatever she wants, when she wants. She goes back for a follow-up check in 5 days. She's doing fine. Other than she's spoiled rotten. Now that we are home, I have her in the living room, and Dot and Stewie in our bedroom. I'm taking all three in this time. It's time for everyone's annual well check. Dot and Stewie will be in their own travel cage and I'll have Fiona in my hoodie pouch. Dawn, I am so very sorry this has happened to Fiona again. This is not only heartbreaking but frustrating for you since she was healed from the original wound. I know this was hard but they were lucky to have you around as owner and friend. Kudos to you. Thank you Karen, and Xeno. 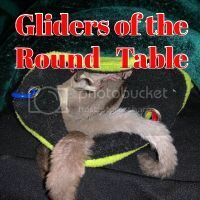 I think part of my issues with this ordeal are my feelings towards all the gliders were bonded. I felt they should visit and see each other even if it was through the bars of a cage. Bad idea. It keeps them motivated to seek each other out. What ever it took... I learned that lesson the hard way. Total so far for 7 vet visits, including surgery, and meds cost us about $500, plus travel time (18 hours) and fuel. That's spread over 5 weeks. I'm not that concerned about the money or the time, again, just documenting. Wow, so sorry to hear this. Your travel is exhausting enough as it is without having to deal with this and poor Fiona! I hope you're able to find out what is causing Dot's change of behavior, it must be terrible for Fiona to have a trusted cage mate turn like this. Poor baby! Hope the story has a happy ending for all the gliders. This would be so difficult for me and I applaud your labor and diligence in your care of your baby! I'm so sorry!!! My heart goes out to you and I hope all is well soon! Fiona is lucky to have such dedicated parents! Fiona is doing great!!!!! They used stitches that dissolve, and a few are sticking straight up, and she is very itchy... Loves her back rubbed. She tries to scratch her back on the cage she's in by rubbing, but so far she hasn't damaged anything. She has lost weight, but she's perky and onery. Runs on her wheel, and when we give her out of cage play, she runs down the hallway opposite direction of Dot and Stewie's cage just to explore and get in to trouble. 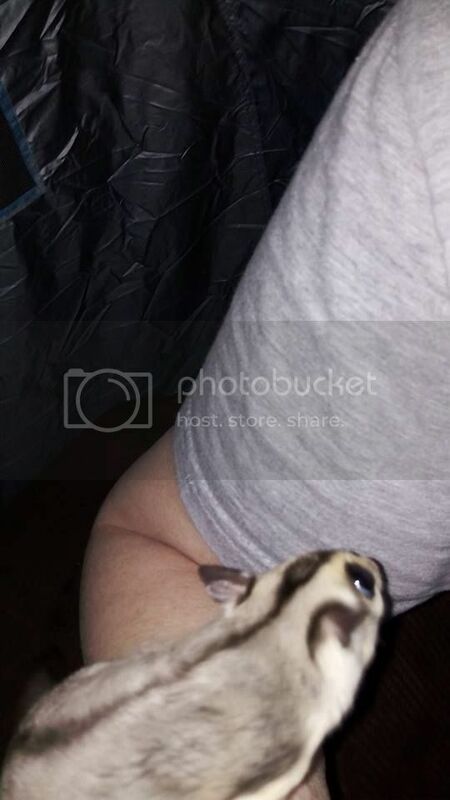 She chooses to stay in her pouch now instead of being carried all day which I understand. She's been poked, prodded, fed nasty meds, nails clipped twice a week, and now she just feels better and wants deep rest. Stewie probably misses her greatly. Poor little guy! She has lost weight, but she's perky and onery. 1 registered members (KarenE), 30 guests, and 315 spiders.